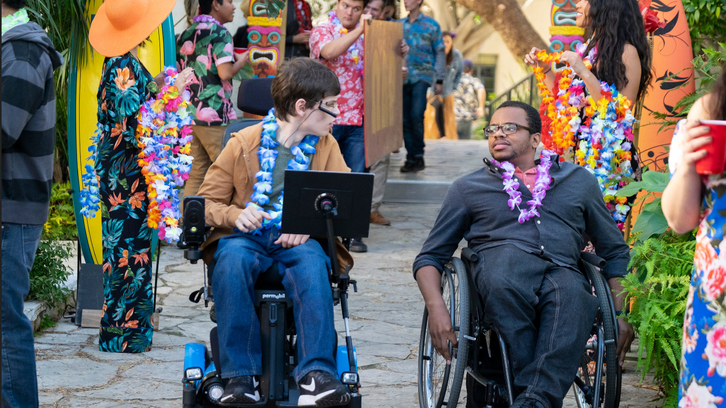 “F-A– FASHION 4 A– ALL” – Maya and Melanie (Sarah Chalke) take their promising new fashion line to the 2019 Abilities Expo, only to walk into a room full of familiar and unfriendly faces. Ray accompanies JJ on an overnight college visit. Meanwhile, Dylan’s test scores lead her first to Mr. Powers’ office hours, then to a journey within, on an all-new episode of “Speechless,” airing FRIDAY, FEB. 1 (8:30–9:00 p.m. EST), as part of the new TGIF programming block on The ABC Television Network, streaming and on demand. Guest starring in this episode is Jonathan Slavin as Mr. Powers, Sarah Chalke as Melanie, Marin Hinkle as Dr. Miller, Shalaby Omar as Alan, Julia Cho as Assistant, Carlin James as College Kid, Jacob Radis as College Kid #2, Rondi Reed as Nina, Nicolas Noblitt as Mikey, Ursula Burton as Mom’s Voice, LaShada Jackson as Woman and Carrie Lazar as Woman #2. “F-A—FASHION 4 A– ALL” was written by Danny Chun & Greg Gallant and directed by Anya Adams.